Starting in 2017, we added two audio speakers to the front yard so that pedestrians and people on bikes can also enjoy our show in its entirety (okay, maybe the more compelling reason is that we tend to spend an inordinate amount of time ourselves out in front of the house watching the show). For the sake of our neighbors, the volume is kept low enough that it can just barely be heard on the other side of the street. When we are out front watching the show with others, it’s easy to turn up the volume a bit to get a fuller experience. We bought the pair of 100W (peak…50W RMS) bookshelf speakers on Amazon for about $30. For as long as it lasts, here is a link to them. These are indoor/outdoor rated and come with a mounting bracket. We have them mounted to a 3 foot tall homemade PVC stand that we spray painted black. As an aside, PVC is one of the finest materials for DIY projects. It comes in different sizes, is easy to cut, has all kinds of connectors, and is pretty darn cheap. Speakers mounted to simple PVC stands (staked into the ground to keep from tipping over in the wind). The “bomb box” is tucked behind the tree. The speakers are driven by a $15 dual-channel speaker amplifier, also purchased on Amazon. 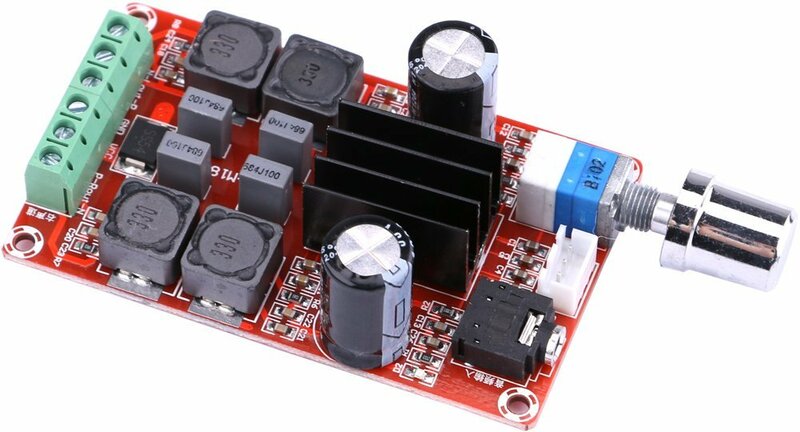 It is listed at 50W per channel, but it’s unclear if that’s peak power or RMS. The amplifier runs off of a 12V power supply and lives in the bomb box in the front yard. For the speaker cables to connect the amp to the speakers, we used some of our extra 2-wire 18 AWG cable that we otherwise use for power injection. The final part of our front yard audio system is a tiny FM radio receiver we purchased on Amazon for $14. 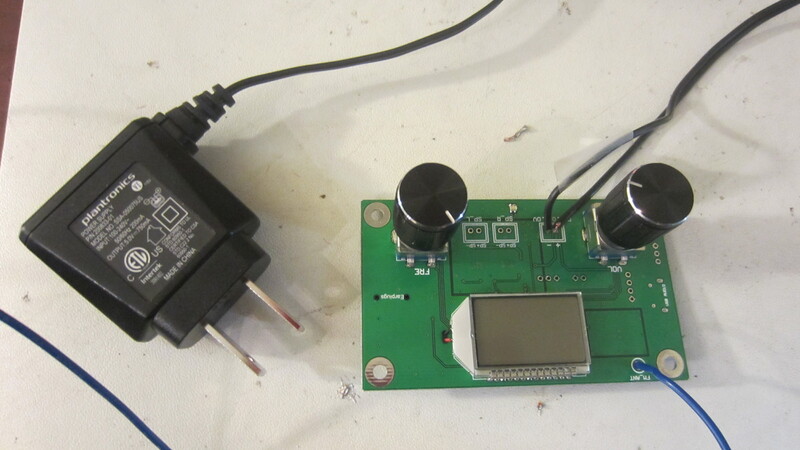 This receiver runs on a 5V wall wart power supply we had laying around (750mA output but that’s probably more than is needed). Philip also soldered on a length of wire to serve as an antenna. Since we are broadcasting our show at 91.3FM, a 1/2 wave antenna is optimized at 164cm in length. This works well for us since we can run this long antenna out of the bomb box and up the back of the tree to get clear reception. A 3.5 mm audio cable connects the output of the receiver to the input of the amplifier. This tiny little FM receiver gives a nice clear signal for our speakers. We had originally attempted to use a second Raspberry Pi module to drive the audio, but this got more complicated than we had hoped. While Falcon Player does support setting up multiple Pis in master/slave modes, it requires that the Pi driving the audio be the master. 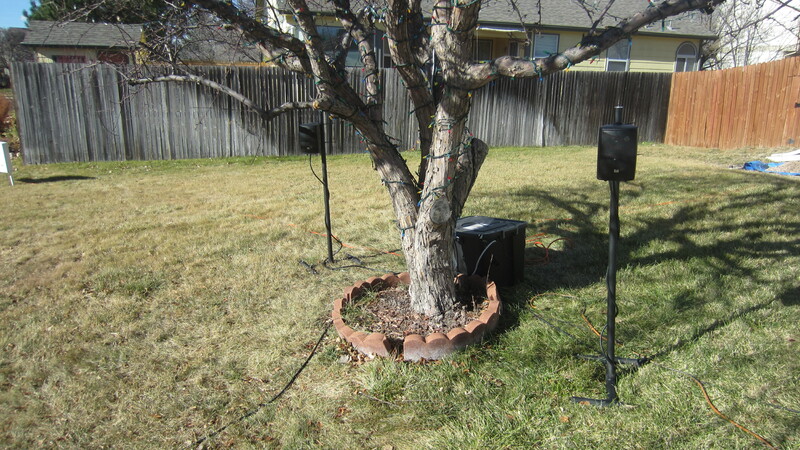 For us, this meant that the master Pi would have to be in the front yard since that is where we wanted the speakers. This would have also required moving the FM Transmitter to the bomb box as well. We got this arrangement hooked up and it technically worked but the performance was not what we desired. The bomb box runs entirely off of Wi-Fi and it seems that the Wi-Fi signal was too weak between the router in the attic and Pi in the bomb box, perhaps because the Raspberry Pi Wi-Fi module is fairly low end. We turned on the show and noticed an increasing lag with the lights trailing further and further behind the audio. As another test, we ran an Ethernet cable from the wireless media bridge in the garage out to the bomb box and this did improve things somewhat and validated that our main issue was the weakness of the Wi-Fi signal to the Raspberry Pi. Even in this configuration, though, there still seemed to be a bit of “slosh” in the timing, though it at least did not get progressively worse throughout the show. The perfectionists that we are, we wanted our timing to be tighter than what we were seeing so we decided to go back to a single Pi setup. Since audio would no longer originate from the bomb box, we picked up the FM Receiver to provide the signal to the amplifier for playing over the speakers.